ALL BRICK 3 BEDROOM BUNGALOW IN HAVELOCKJUST 3 BLOCKS NORTH OF hWY#7 & 30 MINUTES EAST OF PETERBOROUGH, THIS CUSTOM BUILT 1 OWNER HOME HAS BEEN WELL MAINTAINED AND OFFERS IMMEDIATE OCCPANCY. OVERSIZED TOWN LOT, LEVEL AND LANDSCAPED, HARDWOOD FLOORING IN LIVING ROOM AND HALLWAY, CERAMIC FLOORING IN KITCHEN/ DINING AREA AND FRONT FOYER. Interior Features BRIGHT , SUNFILLED HOME, KITCHEN/DINING ROOM COMBO, PATIO DOORS TO REAR DECK, WHEELCHAIR ACCESS WITH STAIR LIFT TO FINISHED LOWER LEVEL. 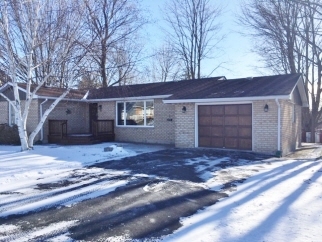 Exterior Features MAINTENANCE FREE EXTERIOR, FRONT & REAR DECKS, ATTACHED GARAGE WITH ACCESS TO INTERIOR, INTERLOCKING BRICK WALKWAYS, NICELY TREED AND LANDSCAPED, PRIVATE REAR YARD.